For astronomy images using SBIG CCD cameras. Is there a better alternative to Equinox Image? Is Equinox Image really the best app in Science category? Will Equinox Image work good on macOS 10.13.4? 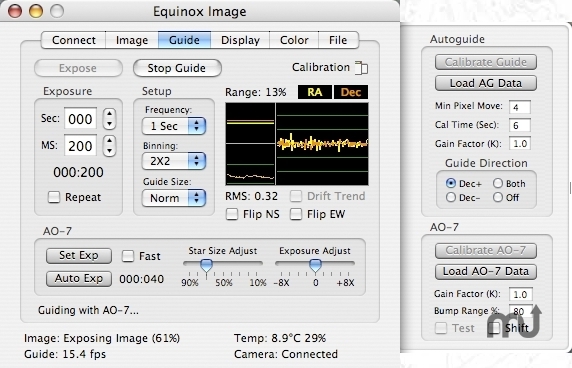 Equinox Image is a universal application to control Santa Barbara Instrument Group (SBIG) CCD cameras (grey scale and color) and Optec or RoboFocus focusers. This program also controls SBIG filter wheels, AO-7/L and remote guide heads. Auto focus, FWHM, RMS error and color enhancement calculations are available. Tools exist to dark subtract, align and stack images, composite color and automate image taking. Equinox Image and Equinox 6 exchange data automatically. Fixed the STT camera bugs. Equinox Image needs a review. Be the first to review this app and get the discussion started! Equinox Image needs a rating. Be the first to rate this app and get the discussion started!